The Infra came as a bit of a surprise when I first saw it, as I was expecting a board very similar to the LaLuz with less flex; but as it turns out its pretty different. Instead of the mostly two-dimensional design of the LaLuz, the Infra has a more complex upper deck shape, with 3mm rails all round, raising up to a thick, stiff central section. The upper deck is finished nicely in a glossy black and white finish, whereas the underside is matte, it also has much less concave than the LaLuz. 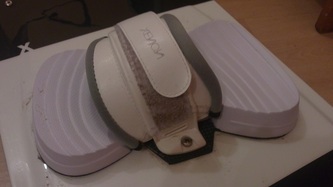 The new pads seem to be a considerable improvement on the 2010's and feature heavily contoured footbeds with soft comfy straps. 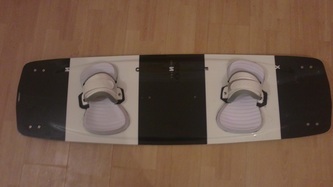 They give a very nice connection to the board when you slip your feet in, and was eager to try them out on the water. The first thing you notice about the Infra is the increased stiffness compared to the LaLuz - this gives a much firmer, more connected ride, somewhat at the expense of comfort in choppy conditions; having said that, it was fine out in the waves, but the reduced flex meant it took a bit more effort to clear the breakers. The Infra jumps onto the plane quickly and easily with little drag, and flies along with a good top speed. Its also a board with which you can cut very high upwind when you really commit to it. 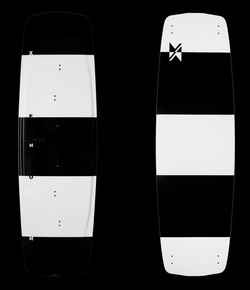 It seemed a capable board to gybe despite the wide tips, which flex to give it increased agility. It rides very well in a straight line, and takes a little effort to slide from heel to toe - much like the LaLuz which uses the same fins. The new pads and straps are a great improvement, and gave good hold even with wetsuit boots on. There is a nice impression into which the ball of your foot rests, and once you spend a little time getting the straps the right tightness, your feet won't be coming out in a hurry! 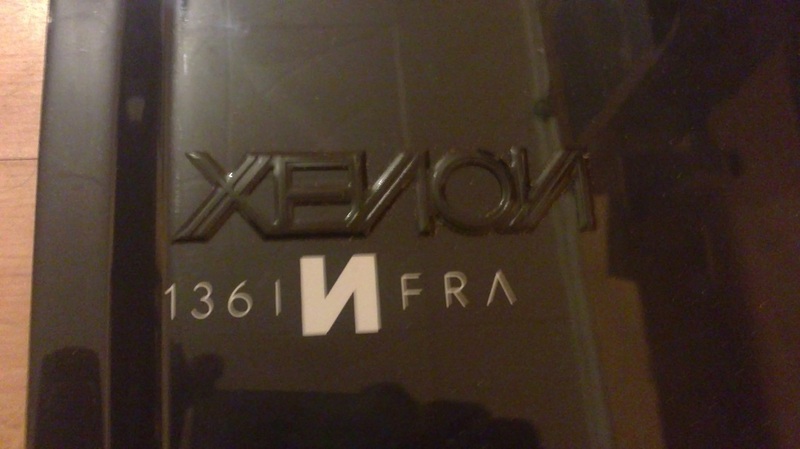 As the Infra is Xenon's high-end freestyle board, I had to put it through its paces a bit! The increased stiffness of the Infra means it loads up well, and pops nice and high, and the flexible tips and 5cm fins work well to give stable landings. Being a stiffer board the landings feel somewhat harder than the LaLuz, but this exactly what you'd expect. The Infra is clearly a board tailored for maximum performance when the conditions are at their best, yet remains reasonably comfortable in the waves or chop. The Infra is a board which gives maximum wakestyle performance in good conditions, it pops hard, lands well, planes early and flies upwind well with a good top speed. If you're after a board which will give freestyle performance in all conditions in comfort, then check the LaLuz out, but if you regularly get to ride on the flat stuff and demand cutting edge performance, then this is a board you'll definately want to check out!